You always feel depressed when you are near her/him. You feel should always be careful in your relationship. You do not feel happy when making an appointment to see her/him. Every time you saw her/him, you're always fighting and arguing. You feel such an underdog in that relationship. There was no spark of love that you feel when with her/him. Envision a future with her/him seem daunting. You can not be yourself in front of her/him. You always put the parapet with her/him. S/he did not let you enter in her/his life. S/he more often to keep a secret rather than share stories. There is always a sense of reluctant to introduce you to friends or family. S/he never planned to make yourself a part of her/his future. There is fear every time you look at her/his face. Your parents give you advice on your relationship with her/him more than usual. S/he too curbs you and does not give personal space you need. The feeling of love is a natural feeling that is never wrong to love someone. Stop beating yourself up because loving someone. Sometimes, a relationship with someone it can not happen. Perhaps because one of the parties is not ready for a relationship or because you have not met the right person for you. 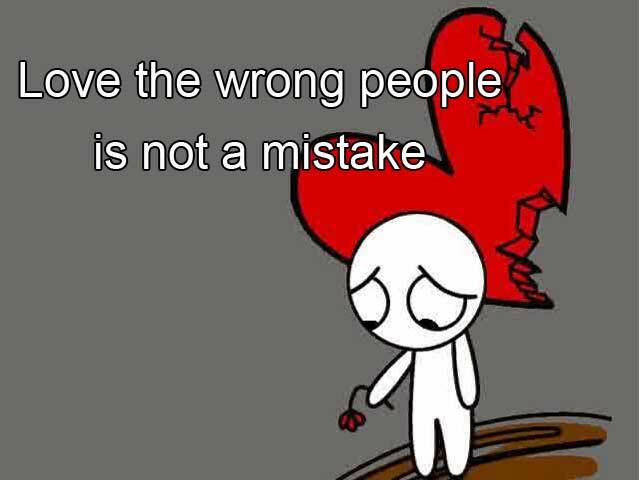 So many of us are stuck and punish ourselves for the love of 'the wrong person'. You can free yourself from guilt, feelings of rejection, feelings of anxiety and depression by accepting the fact that for some reason, you love that person. And this is not a mistake! The sense of love is much better than the feeling of anger and frustration. Forgive and love will relieve you from disappointments and encourages you to continue living. Human energy can be attracted to other men. When your energy in the form of love, anything can happen. Many people who experience the painful expertise in a love relationship, but they can learn and train themselves to still be loved, loved unconditionally. Although ultimately destroyed your relationship, there must be a lesson that you can learn from the relationship. You can use your experience as a correction. We need to continue to learn and grow to achieve happiness. Life is what you focus on something. So today, start focusing on the goodness, not on ugliness. You will see a significant change in your life when you do it. 0 Response to "Love the wrong person is not a mistake"